(19.07.2013) After his demand for political asylum was rejected by the Republic of Cyprus, Turkish conscientious objector Onur Erden was deported back to Istanbul via Jordan on Thursday, July 11th. He was arrested after his appearance in the court and transferred to military prison in Kasimpasa Naval Base in Istanbul. On 17 July, he was transferred to the 2nd Army Corps Command Military Prison in Gelibolu, Çanakkale. He remains in custody. You can send a protest email here. Onur Erden declared his conscientious objection in March 2011. He said that he refused to continue with military service because “I don’t want to be a party to the ongoing war in our country and because of my humanitarian values”. Previously he served in the military for 3 months in 2006, after which he deserted and was imprisoned several times. During these detentions, Onur says that he was ill-treated. According to his lawyer, Onur Erden has over nine months left to serve from his first two sentences for desertion. On each occasion, he was released on the condition of presenting himself to his army unit within one day, but did not. He is expected to be tried in a military court in Gelibolu and the remainder of his previous sentences are likely to be added to any new sentence he receives. 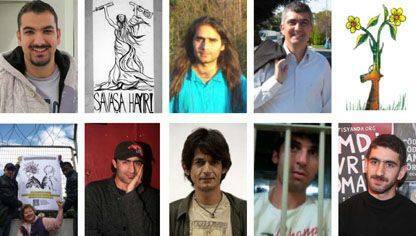 War Resisters' International calls for the immediate release of conscientious objector Onur Erden, and all other imprisoned conscientious objectors.